As I approach 50 days into my current “Morning Meditation and Movement Protocol” (It is changing my life; I will expand on the details of this program in the future), I find the most significant difference is my level of awareness. I am aware of the words I use, the decisions I make, the eye contact I hold with people, the level of engagement some interactions receive or lack there of, the speed at which I disengage from other conversations, and my compassion towards all. This new level of awareness is really presenting itself as the power or gift of meditation…the stillness in my life. To begin, meditation had never “worked for me.” I never felt relaxed or Zen. I did not feel like Buddha. I did not float around the room after a session. These expectations or trappings I held in my mind were limiting beliefs. However, once I jumped into a practice, benefits started appearing with ever-increasing consistency and now I am hooked. I just needed to relax and trust that what I was doing could only improve my life. Letting go of how I thought how changes would present themselves has been the biggest take-away. A short story: My level of reactivity towards stress-triggers has been dramatically reduced. After a work -accident playing a bird flying around the stage in a Peter Pan style flight-harness (Yes, my job is that cool), I tore a muscle in my abdomen. Because of the few surgeries I have had in the past (cancer in 07’ and a lost a foot of small intestine in 11 feet due to post-surgical scar tissue), I knew it was smart to get a scan and make sure everything was ok. So I got an MRI a week after I had started to feel better. I did press for results and figured if anything was way out-of-whack the doctor would call. It so happened that a doctor who was not familiar with my particular surgical history got ahold of my scan and on Christmas Eve, told me, “I think I see some type of swollen nodule in your abdomen wall and you should follow up with an oncologist given your history.” OUCH. Now don’t get me wrong, I was upset and it shook me. But I was able to breath, not be reactive, and instead practice positive action. I enjoyed Christmas until I could get back to my doctors in NYC and then do everything in my power to follow the proper channels of follow up. And it was nothing. :-) However, in the past, I had a cyst on my hand and in an hour was convinced it was a tumor….sending me into a crying fit in Bed Bath & Beyond (not Zen). This old reaction was me living in the past or fear of the future. Neither was in the Now, the Present. Because I did not have the ability to travel through time, this reaction was not serving me. Inspired reading and meditational supplements: Upping the power of meditation alone. A book I am currently reading directly before my meditation (a few paragraphs each day) is “Practicing the Power of Now“ by Eckhart Tolle. It’s amazing how it only takes one idea, one sentence, to completely change your day thus sending it in the direction of incredible volcano of love-mush. At least that’s the way I see it. My rationale: Reading inspired words before you calm the Mind is like planting the seeds you want to grow. You could also read afterwards…Why? Because there are NO RULES!!!!! These following are a few of the thoughts that are currently rocking my world right now and planting a garden of inspired ideas in my mind. Are you guys excited about the harvest I’m going to reap? There are no problems in the Now, as there is no illness. It’s the energetic equivalent of someone telling you “You’re stupid” before you take a test. Studies show you will in fact test worse than those receiving positive encouragement or affirming your own greatness (even better in my opinion to not rely on the outside help!). Refrain from labeling anything that’s happening in your body mentally. Be it a torn ACL, abdominal adhesions, IBS, clinical depression. When you breath and remain present with the breath, your situation is reduced to one of several factors: physical pain, weakness or discomfort. “This is what you surrender to- this is now. You do not surrender to the idea of “illness.” These moments of discomfort are manageable and well within your scope of skills to overcome. Again…”illness” denotes a wide symptom-set; Labels to which you are attached. 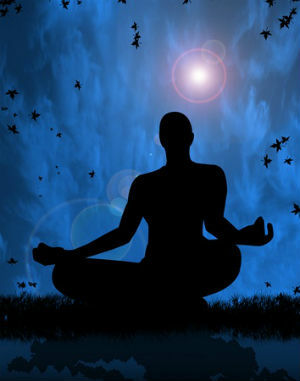 So now that we have planted a few inspired ideas…Let’s try a meditation together. Maybe you’ve explored meditation before. Maybe you haven’t. Either way, this is going to be fun! Pull up this song on your phone or your computer. Follow the directions below for ten minutes and tell me how you feel. Breath, focus on the breath gazing at one point on the wall or the floor with a soft gaze. Breathe in for the count of 4 through your nose and out through the mouth for 4. Pick a phrase which keeps your mind focused and centered on the moment. The first half of the phrase on the in breath, the second on the out exhale. Continue till the song is over…….Do you feel worse? Did you stay with your phrase and the breath? Trust me it gets easier and better, and the benefits are dynamic! Please do me, your friend Freddie, one favor. In the comment section, tell me about your experience and how it was: Amazing? You thought it sucked? Either way, I wanna hear and hopefully I can better direct you to success in 2015. There are million ways to incorporate meditation into your daily practice, into the lives of your kids…It’s even possible to get the parental-units hooked. Here are a few nice articles on meditation with some addition information all which I found very informative and help in developing my practice. That’s it for now, Friends. Until next time, eat well, be well, and live well. As I have said before, while I have played a doctor on stage, I am not one in real life and this information is just that, free information. It is in no way intended to treat or cure any disease or illness. Readers interested in working with me as a health coach should visit the GO! page on Freddie, Set, Go and inquire about monthly rates. ← What is the American Gut Project? Thank you for confirming what I am beginning to believe. My yoga teacher training has just begun this month and I am also paying closer attention to my surroundings, interactions, worries, reactions, and taking stock of the changes I see in myself each day. I have been reading pieces from Pema Chodron and I find her words help my positive outlook before (and after) meditation as well. Keep moving on your journey! Thank you for sharing it with us. Much love to you! Sarah, I’m going to go grab that, always looking for new literature people are reading that inspires and speaks to them. Love that we are linked up on this journey of health and vitality together. Sensing you much love for your continued support!